One of the first things you learn in geography is that maps lie. Maps are a 2D simplification of a 3D reality, often static, and necessarily tinged by their creators’ decisions of what to include and leave out. The map is not the territory. And yet: in many ways, the map is the territory. I find it unsettling not to know where I am and what direction I’m heading. Knowing our geographic location kicks off a chain of associations, whereby we make an evaluation of the places we find ourselves in and their relation to us. We’re always layering multiple levels of geographic knowledge and perception in this way. Road maps are calming. Geography is evocative. And place is powerful. 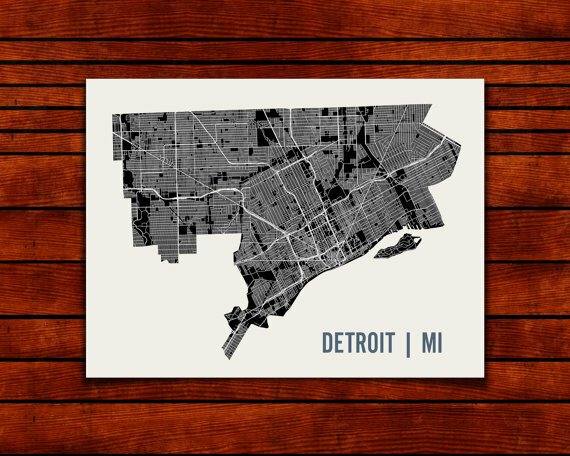 There are two maps hanging in my apartment in Detroit. 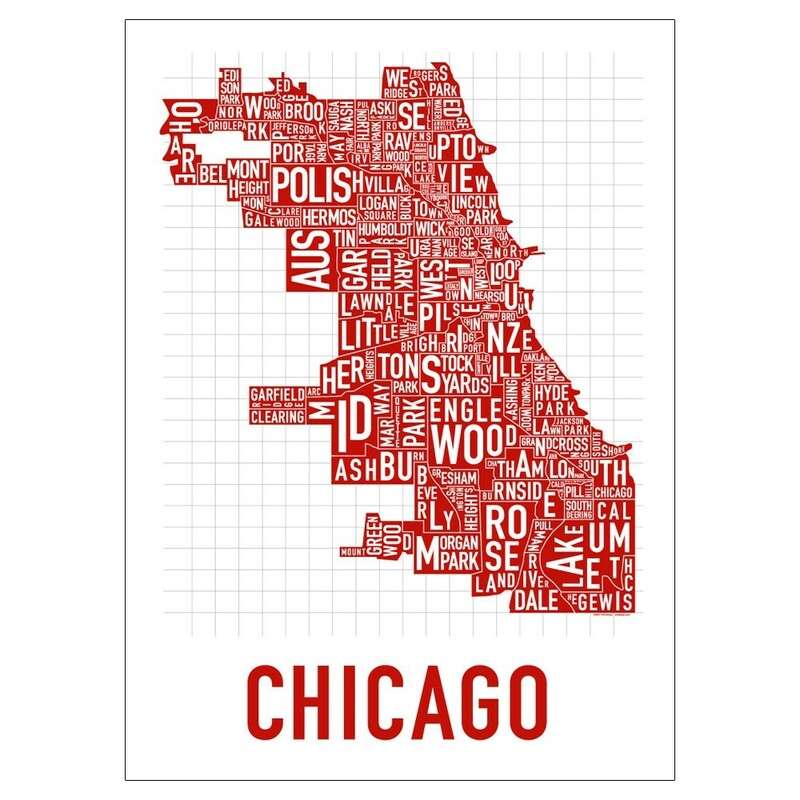 One is this typographic neighborhood map of Chicago. As the oft-repeated refrain goes, Chicago is a city of neighborhoods, and such was and is the case for me. The neighborhoods have been the lens through which I understand the city. It gives me comfort to be able to point to this map and say: this is where I’m from. And over here is the place I wrote my thesis on. And up there is where I spent my days in the city. A map like this brings something vast and hazy like the South Side closer to comprehension. And even the grid system makes its appearance, looking mighty serene on paper. Next to Chicago hangs a map of a smaller size. It’s Detroit, though sans neighborhood names. Just white streets on a black background, the spokes slicing through the city. People often speak of Detroit, with excitement, as a blank slate–it’s fallen so far that opportunities abound for everything from urban farming to public art projects to socially-minded businesses. The opportunity part is correct, but Detroit is not a blank slate, or a ghost town: there are hundreds of thousands of people living here, and like any place it’s shouldering the burden of its history. We hew to these metaphors and narratives that compress and distort the city, often do it a disservice, because they make something massive and teeming easier to perceive. Detroit is more a crucible at the moment than a blank slate, maybe. Inevitably, these metaphors are bound to simplify a complex reality. But the simplification implicit in narratives, and maps, is often a necessary component of better understanding place. So I look between these two maps: Chicago, already jam-packed and bursting with bold color, and Detroit, more muted and with space within to fill. 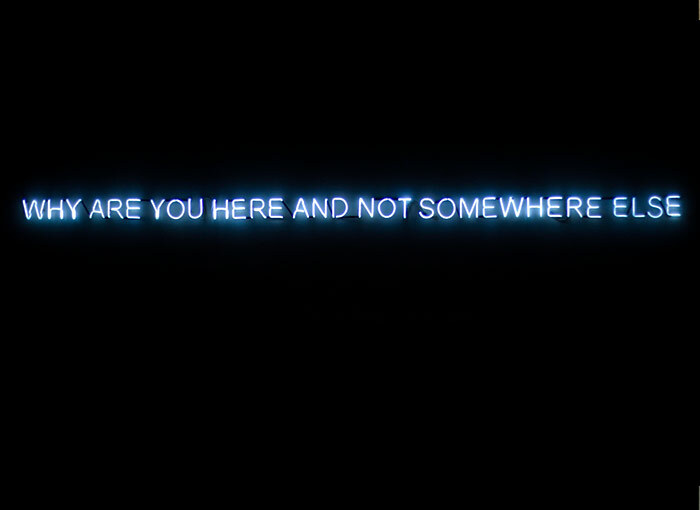 And I find myself returning to that question: “why are you here and not somewhere else?” I honestly have less of an answer than I did before I moved here. Living in a place and engaging with it has a way of troubling these easy binaries–Detroit as wasteland and Detroit as land of opportunity. But here’s the thing: everyone else is constantly asking the same question. People here keenly care about the place they are living. If you live here, you’ve made a conscious choice to move in, or move back, or stay here. The city sits at the forefront of people’s minds, on the tip of their tongues. The map is actively being re-drawn. This is preciously rare; established cities don’t just go through a wholesale sea change. Detroit, as a mental concept and literal place, is potent and meaningful. And so I look to the map to place myself within the mass of street-lines, searching for answers to that unremitting question: why are you here and not somewhere else? Around me, Detroit shifts.